Students in the science-writing class celebrated the end of the semester by enjoying ice cream frozen with liquid nitrogen. Powering up on vitamin C to avoid getting sick during cold season could be a low-stakes version of the now-ridiculous belief that Earth is the center of the universe. Both are common beliefs of their time. Yet skepticism and critical thinking, driven by science, helped to prove that Earth revolved around the sun and likewise has revealed that — unless you’re a marathoner or soldier in extremely cold temperatures — extra ascorbic acid isn’t likely to keep you from falling ill.
“If you have a better understanding of the history of knowledge, you realize the things we think are true now are going to change, and you have to be open to that new learning,” says Douglas Mulford, senior lecturer of chemistry and the director of undergraduate studies for Emory's chemistry department. Mulford’s first-year seminar, “How Do We Know That: 2,500 years of Great Science Writing,” aims to help students develop those skills by delving into scientific claims of the past and present as well as the ethics that go with scientific advancement. His course goes to the heart of the plan, showing that the ability to evaluate the quality of evidence, and spot errors or manipulation, is central to personal success and lifelong learning. In Mulford’s class, students develop that higher-order skill by reading works from the scientists themselves, not what was written about them or their work. For Galileo, that means delving into Socratic dialogues he wrote casting the Pope as a simpleton who could not grasp the savant’s work — namely Galileo’s assertion that Copernicus was right about the nature of the universe. His proof: Looking through a telescope and discovering moons around Jupiter whose positioning made it clear Earth was not the universe’s center. Michael Silver, a first-year student planning to major in business, said the class reminded him of his International Baccalaureate program in high school. The vitamin C studies, for instance, showed Silver that the nutrient’s health boost was negligible. That empirical evidence then opens the door to questions about how people know something scientifically as well as morally, he said. After all, eating an orange when you feel run down may not cause harm. But other claims — whether later proven true or not — raise issues about the ethics of knowledge. That is knowledge that transcends discipline, and emphasizes the goal of Emory’s QEP: for students to understand how they know what they know, Scott says. 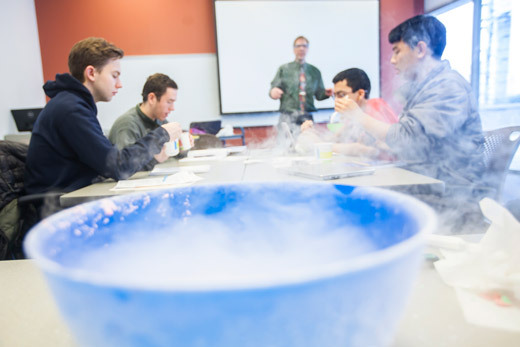 For Mulford, known for his captivating experiments using liquid nitrogen and thermite reactions, the fun is in sharing not only what thinking advances knowledge but also how that thinking came to be. Charles Darwin, for instance, sat on his theory of natural selection for years not only to do more research but also over fears he would be seen as anti-religious, Mulford says. Only when he collected so much data that he couldn’t deny his theory did he move forward.